You are here: Home / furniture makeover / Try this easy kitchen cabinet makeover that’s renter friendly! 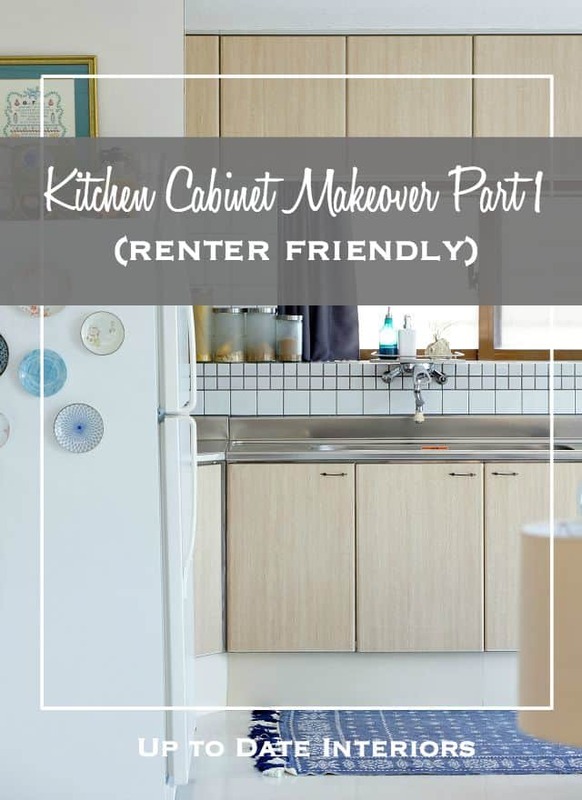 Try this easy kitchen cabinet makeover that’s renter friendly! 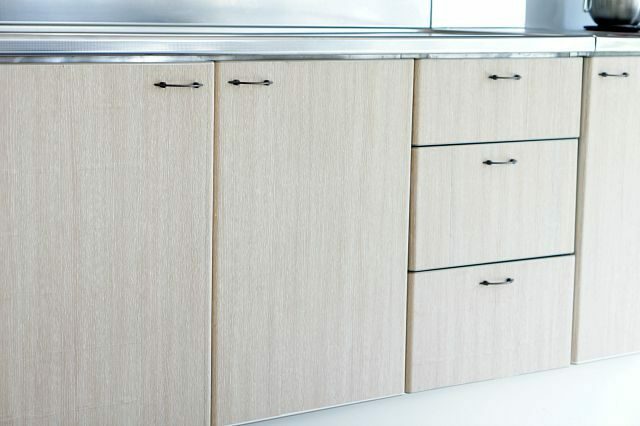 Kitchen Cabinet Makeover- Don’t spend a fortune making over ugly rental kitchen cabinets. Use contact paper that can easily be removed for a chic redo! Well hi there! How are you today? 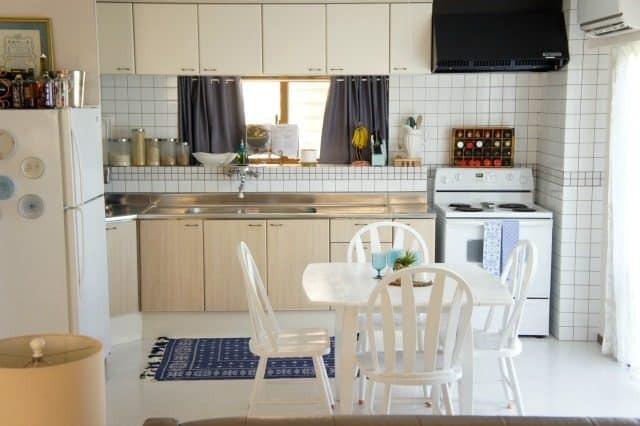 Welcome back to my blog and our Japanese rental in Okinawa. If you are new here, we are a military family who moves around quite frequently so I’m always looking for ways to overcome rental obstacles and share rental friendly decorating ideas and DIYs. 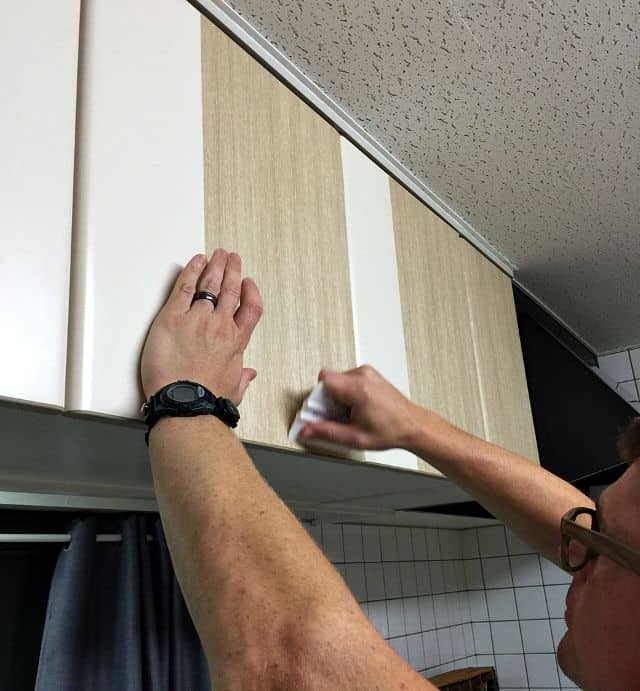 Right now we are working on a kitchen cabinet makeover and you won’t believe how easy and inexpensive it is! This DIY deserves a little back story…. 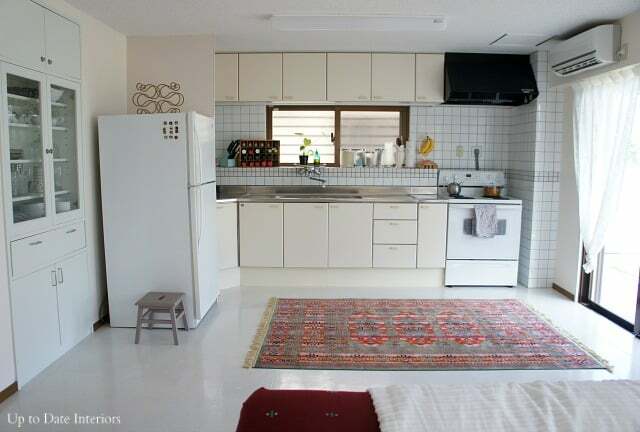 When we were looking for a rental, I fell in love with this house because of the bright rooms and the white kitchen. Once we got our “true” white appliances in, the kitchen cabinets went from off white to yellowish. Not bad but I wanted to do better! 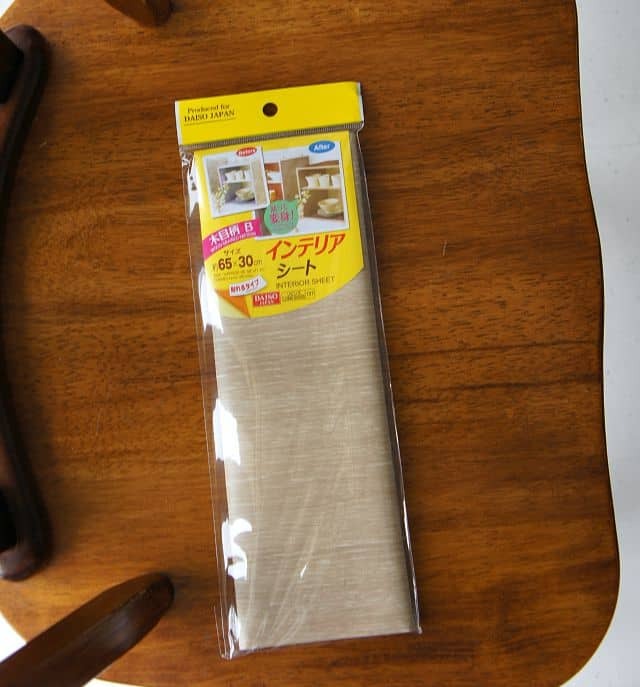 I decided to try a light wood shelf liner that I found at the 100 Yen store (our dollar store) to transform the plastic cabinet doors. They come in single sheets so my hubby and I just stuck them in place and smoothed out the air bubbles with a tool I had for decals. We had the bottom cabinets done back in March. It only took a couple of hours. I decided to live with them for a few days before we did the top. I finally took the plunge and finished the top cabinets. (It took one hour.) Wahoo! If you try this at home, make sure you are lining up any patterns or grains in your contact paper. On a side note, I removed one to see how hard it would be and it came right off, no problem. A huge relief since we are renting. Tip: To make cuts while the contact paper is on the cabinet, score lightly with a box cuter or crafting knife. Otherwise, make cuts with a ruler and scissors before hand for a custom fit. The original plastic pulls are being temporarily replaced with new ones. More on that in Part Two! Right now, I’m enjoying the look of our “faux wood” cabinets. They look lovely with our kitchen table I scored for free and gave a somewhat unusual paint makeover. Our DIY fridge plate magnets are still a favorite and also happen to be a dollar store craft. Part Two of the kitchen cabinet makeover will include the pulls and toe kick. Then just a few more tweaks and the kitchen makeover will be complete! Have any of my fellow renters tried using shelf or contact paper to makeover cabinets? Are you wanting to try a room makeover but not sure where to start? 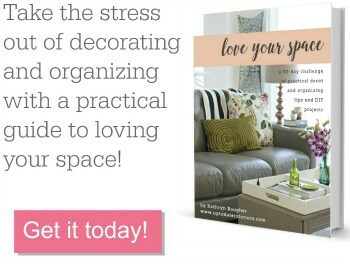 Check out my FREE 5 day email decorating course! Looking for something more bold? Check out these makeovers! Wow! I’m amazed by how good this looks. Who would have known? Thanks for the great ideas! I’m kind of amazed too! Not bad for shelf paper. lol Thanks for the sweet comment. ooh, I bet the grasscloth is pretty. I’m thinking about adding shelf paper to our cabinet with glass doors. 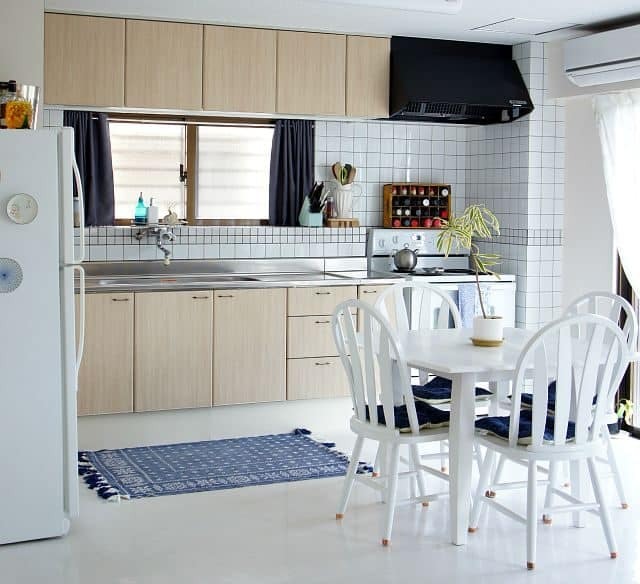 🙂 BTW, I love ALL white kitchens too! I really need some shelf paper to redo my cabinets as I am trying to get ready for sale. Maybe I should come to your 100 yen store and find some nice stock to use. Or better yet why do you pick out some, buy it, bring it to me and you come and install it? That would be fun. That looks amazing! I can’t believe it’s just shelf paper. What a great idea. And I can’t wait to read more about the pulls. They really finish the cabinets. What a great idea for renters! Love it! Thanks Katie! It take a little bit of time but it’s super easy and will be easy to remove when we leave. What a great idea! I would love to try this myself since we’re moving into a villa soon. The kitchen is spacious but all the cabinetry is dark wood. The only problem is, it’s got wood piping a couple inches from the edges. I guess there’s no way to cover the full door is it? I’d probably just have to contact paper the part inside the raised piping. Any ideas? Thanks in advance. The raised piping might be fun detail left dark with lighter cabinetry. otherwise, you would probably have to cut smaller strips to over it. That could be really tricky depending if there’s a pattern in the contact paper. I was actually thinking of using a contrasting color to create a “molding” on my flat cabinetry! Good luck! 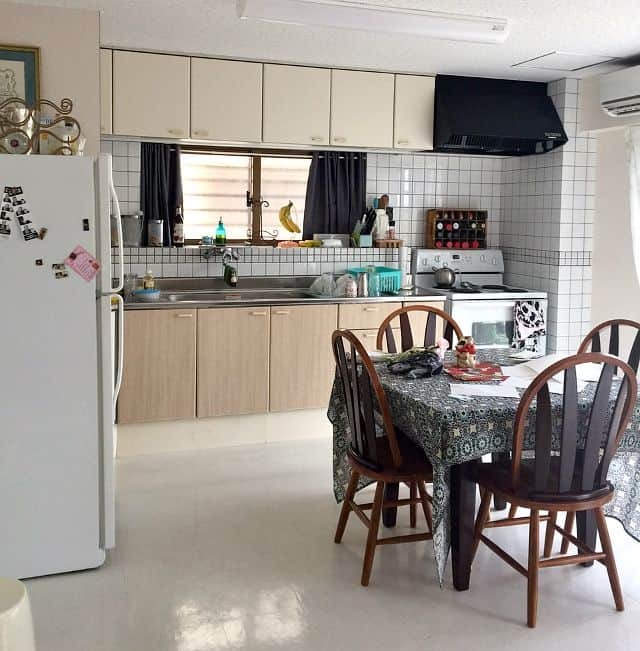 I love what you did to this kitchen, currently stationed at Kadena in Okinawa and looking for ideas to spruce up base housing. Thank you! Have fun in Oki!